AVALON — The largest party in Catalina history was held at Avalon Harbor and on the Pleasure Pier in May, with more than 1,300 people visiting the island to participate in a weekend-long event fusing elements of Mardi Gras, Coachella and the Stagecoach Festival. Bud Light brought its second-ever #UpForWhatever party to Avalon on May 29, with 1,365 “unique visitors” visiting the island through May 31 to attend concerts and patronize local businesses. All of the weekend’s events occurred in the fictional town of “Whatever USA,” which was built on Avalon’s waterfront and occupied more than 1 million square feet of event space, including a pair of 20-foot-high-by-30-foot-wide arches at the two farthest ends of the fictional town. Only those hand-selected by Bud Light and a fortunate few wearing wristbands were allowed within the fictional town. Bud Light, which is a subsidiary of Anheuser Busch, made a $500,000 donation to the city of Avalon for hosting the party. The money will be used to convert the grass at the softball park at Joe Machado Field to turf to help the city conserve water. Avalon Harbormaster Brian Bray said the second-ever #UpForWhatever event was well organized. He added accommodations were made for boaters who arrived in Avalon during the event and were not part of the festivities. Capt. John King of Afishinados Charters hosted a booth on Pleasure Pier during the Bud Light event. In a column he wrote after the event and shared with The Log, King said the weekend-long #UpForWhatever event proved beneficial for Avalon’s businesses. 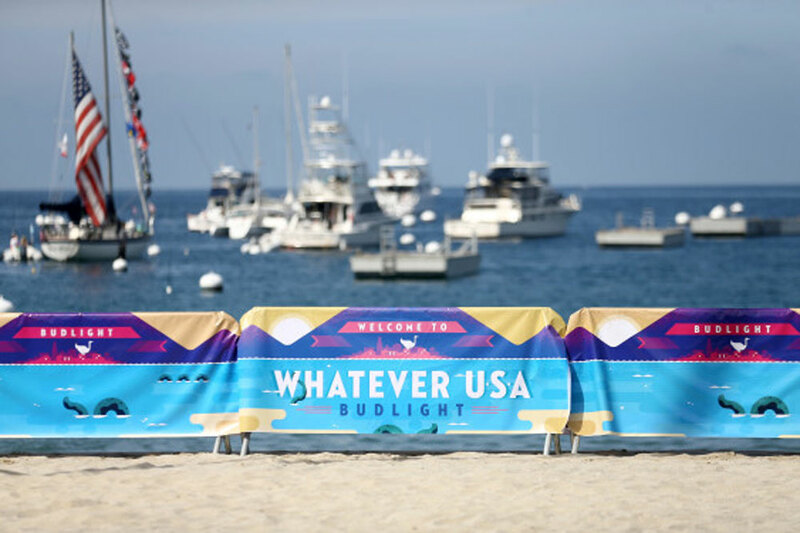 “This entire weekend was a marketing tactic that will generate tremendous amounts of ‘viral’ messages and media impressions for Bud Light and for Catalina Island. The hotels pretty much sold out, the restaurants in the zone sold out [and] many outside the zone had stellar weekends. Caterers were booked, items were purchased, boat tickets were sold, transports were running, residents got work,” King wrote in his column. King commended city officials for allocating the $500,000 cash prize to address the island’s water problem and was supportive of converting the grass at Machado Field to turf. Based upon information provided to The Log, the #UpForWhatever event was anything but a big problem. The event’s guests and staff were hosted in more than 21 hotels, houses and condos between May 29 and 31, according to Bud Light. The event opened with a tour of Avalon and the island. How much money Avalon’s businesses earned from #UpForWhatever was not yet available as of press time.